The link to this article originally appeared on the Emmanuel House main page, but had stopped working, so I am re-posting it directly to this website. The article first appeared as the front page story of the 16 September 2013 Aurora Beacon-News. 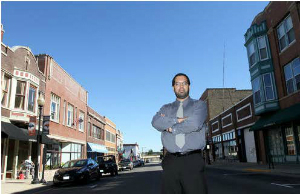 AURORA — A non-profit hub, a start-up generator and a community center? These are next big ideas fueling the potential for a new era on LaSalle. From Benton Street and Downer Place, the downtown strip known as the historic LaSalle Street Auto Row is nearly 50 percent vacant. The block-long stretch doesn’t connect to major city thoroughfare New York Street and “is a little bit off the beaten path.” But that isn’t keeping some from investing big to jump-start the block. The latest building to near rehab on the strip is 73 S. LaSalle, now owned by Aurora-based non-profit Emmanuel House. Co-founder and board chairman Rick Guzman said the non-profit will move Emmanuel House headquarters into the building, but three-fourths of the space will house non-profit World Relief offices. “At this point, given some of the vacancy rates, given that some of these places do need a significant amount of investment, (LaSalle) is not the top candidate to bring in tax-paying businesses (to the downtown),” Guzman said. But feet on the ground could change all that. “(We’ve) got some work to do here. It may not be non-profits forever, but it begins to bring life,” he said. For non-profits, LaSalle is an easy sell, Guzman said. “Non-profits are saying, ‘it would be great to be downtown, it would be great to be near a high-need community that is in the heart of the city’s Neighborhood Revitalization Strategy area,’” he said. And there’s big bang for a non-profit buck, too. Emmanuel House purchased the 5,000-square-foot building at 73 S. LaSalle St. out of foreclosure for $63,000 in 2012, according to Hayley Meksi, Emmanuel House executive director. She plans to move her staff of four and World Relief’s 15-20 employees into the LaSalle Street space in January 2014. In 2006, the building sold for $205,000, Guzman said. Splitting office space with a partner organization will allow the two non-profits to share resources and staff, Meksi said. Emmanuel House aims to help working class families purchase their first home, and World Relief DuPage-Aurora’s mission is to serve immigrants and refugees. Emmanuel House is planning for a $100,000 rehab of the space. Many rehab-related services are being donated by Emmanuel House partners, Guzman said. The non-profit has experienced significant growth in the last few years, growing from two properties in 2011 to five properties, including the LaSalle Street office, to date. Another house on the city’s West Side that will provide refugee housing is currently under contract, Guzman said. Guzman, who also serves as Mayor Tom Weisner’s assistant chief of staff, said Emmanuel House will not accept city funding while he’s employed by the city and serving as the non-profit’s board chairman. World Relief spokesman Jennifer Stocks said the non-profit hopes to move into the building in the first week of January, moving out of a building on Downer Place owned by developer Dan Hites. “We do work together on certain projects, and this is a great fit,” Stocks said. These two non-profits may be the first of many to relocate to the street. Guzman said Emmanuel House may purchase neighboring LaSalle Street properties in the future. Nearby 62-64 S. LaSalle Street was donated to the National Boy Scouts Foundation in 2012, confirmed Matt Ackerman, executive director of the Three Fires Council. Ackerman is working with non-profits Communities in Schools, Triple Threat Mentoring and Community 4:12 to develop a future use for the four-story, 20,000-square-foot building. The spot could fill the void of the Fred Rogers Community Center on the East Side, which was purchased by East Aurora to convert into a magnet school. “We’re finding out what everybody needs to determine the best use for the community,” he said. Aurora photographer Jimi Allen, who is developing a co-working space in a vacant 16,000-square-foot building at 56 S. LaSalle, said the potential of a non-profit hub would work well with start-ups. The people behind the LaSalle Street ventures are like-minded, Allen said, and he wants to build a business community in downtown Aurora that is socially aware. “What could be more inspiring than people who are living marginally or refugees? That’s the beauty of Aurora,” he said. City Council will discuss a development deal that would kick $457,000 toward Allen’s project on LaSalle Street at 5 p.m. today at City Hall, 44 E. Downer Place. ♦ Go to the EMMANUEL HOUSE main page. This entry was posted in Social Change and tagged Emmanuel House, Hayley Meksi, Jimi Allen, LaSalle St. in Aurora, Rick Guzman, Stephanie Lulay. Bookmark the permalink.